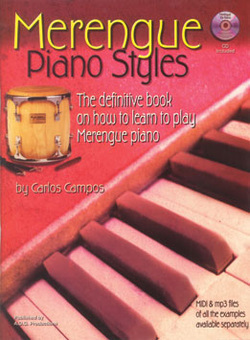 Merengue Piano Styles is the definitive book on how to learn to play Merengue piano. Campos has created a collection of piano patterns in both Derecho (straight) and Pambiche or Merengue Apambichao (more syncopated) styles while using basic harmonic rhythms and chord sequences. Campos has also included a CD with many examples recorded with piano, bass and percussion. Merengue Piano Styles offers hours of educational and fun playing!